This CD is not a showcase of Dwight's soulful, heartfelt vocals; or his musicianship on the mandolin and slide guitar; or the great company of musicians he selects such as the Subdudes' John Magnie and Steve Amedee. They got a good, good thing! Good Thing is an eight panel, full-color, environmentally-friendly packaged CD using recycled materials. You still get color photos and all the lyrics, without the wasteful plastic tray or jewel case that often breaks and is discarded. While this packaging is a more expensive approach, it makes Good Thing a right thing! Andy Volk, Freelance Writer for Steel Guitar World & Acoustic Guitar Magazine and author of The Lap Steel Guitar Book soon to be released by Centerstream Publishing. No gimmicks here, just a good solid performance and production from a multi-talented musician: composer, poet/lyricist, singer, and instrumentalist, and his musical buddies. There are varied moods in the CD, lyric, rhythmic, melodic, and instrumental, enough that it maintains a refreshing quality from beginning to end. Let's hope Dwight doesn't take this occasion to rest with his well-deserved laurels, but gets to work soon on giving us more "good things." 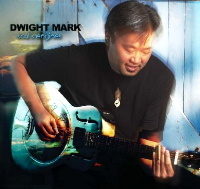 "I have known Dwight Mark for almost a decade. We met in the early 90's when he decided he wanted to play just about every instrument with strings attached. The thing that impressed me then was his creative drive and determination to find his own voice. Clearly, Dwight has arrived with his latest effort entitled Good Thing - great songwriting and musicianship which walks between the lines of pop music and his acoustic roots. In a world hungry for good solid adult rock music, I was so excited to finally receive my copy of Dwight Mark's first complete CD release "Good Thing". I was really blown away by the way "Good Thing" was able to showcase all of Dwight's vocal, instrumental and songwriting expertise. "Good Thing" assembles Dwight along with some of Colorado's finest studio musicians into a very listenable collection of just plain good songs. Thank you so much for sending me your new CD. I spent the past hours listening to your songs and I wish you will go on creating such nice music for the people in a time where we all need beautiful things and peace. Dwight Mark's "Good Thing" is a "Great Accomplishment!" I have been playing Dwight's new CD constantly since receiving it and listening to it - it has already become like listening to an old friend. And by the way, Dwight's an old friend too. Every chance I get I make it a point to play his music for friends and family alike. The quality is just so "Good". As they say, this set of music has "Legs" and we will count ourselves luck to keep hearing this and more from a truly gifted singer songwriter. Just wish we could here tunes off of the CD more often during Dwight's live performances. It's a pleasure knowing Dwight and seeing his musical career blossom. He deserves this success and we deserve to hear his great work. That's why I broadcast all of his recent tunes on internet radio. I hope to be adding more of Dwight's great music to the broadcast in the future. Right now you can hear all of the tunes from the "Good Thing" CD as well as a couple of treats (pre-cuts from Mountain Moves that include earlier versions of tunes from Good Thing as well as others. Check it out at www.eltonmohito.net (I have a link to Dwight's stream there). Dwight Mark has not only complemented Dysfunction Junction, but has taken our music to a whole new level. He came into our world with a ****load of stringed instruments, an unconventional technique and energy that captivates the audience. He has definitely added a new dimension to our Lodo performances. Dwight's new solo project seems to be an expression of what is not readily apparent during our live shows. It's more of a musical expression of his passions: nature, travel, family, friends and the mysteries of love. He's somewhat reluctant to merge these original pieces with our roots rock cover hootenanny, but if you ask nicely (and buy him a shot of tequila) he may play a few during the breaks." I just wanted to drop you a line to thank you for your new and fantastic CD. You really do have a lot of talent and the drive to make all of your dreams come true! My favorite song is "Too Soon To Say" and I really love your version of "In Your Eyes"!